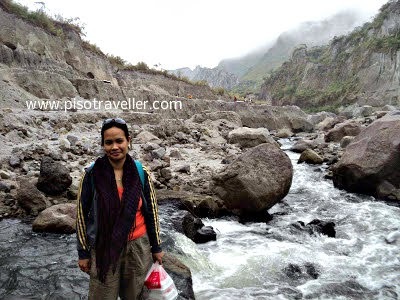 Piso Traveller: I Conquered Mt. 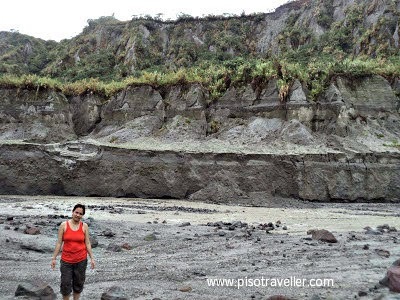 Pinatubo and More! 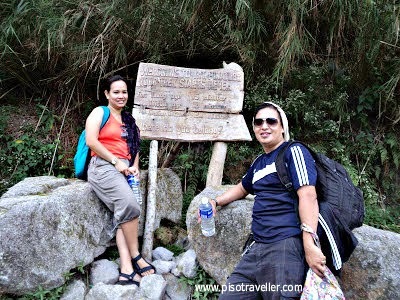 Last Saturday, together with my husband and 13 other friends, I conquered Mt. 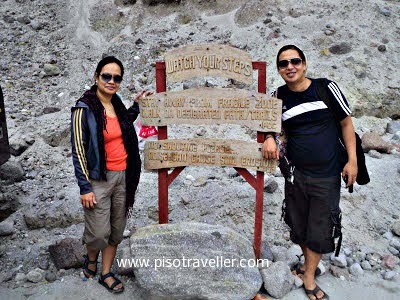 Pinatubo and more! Our journey to the volcano crater was exciting. We started off with a 2am pick-up in Ortigas, a stop over at McDonald's Panay for food and registration and we were off to Tarlac. We were there at 5am and we had our breakfast. 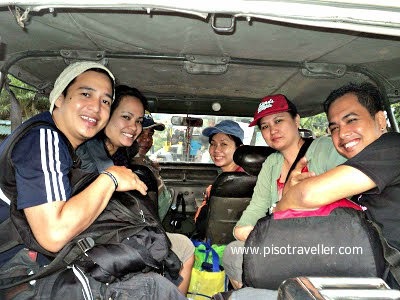 At 6am, we were already on the 4x4 for the 1.5 hour ride to the base camp. It was a bumpy ride to say the least and I had my eyes closed on the more dangerous (for me!) parts of the ride. But I can feel that my husband would have traded places with our driver in an instant! By 730, we were about to start the trek. 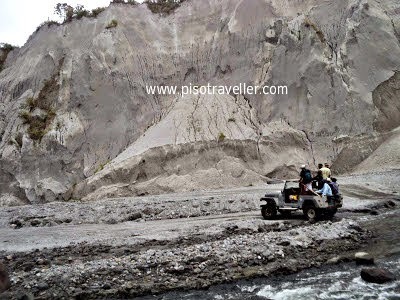 Every 4x4 has 5 passengers and a tour guide was assigned to each group. Our tour guide also served as a porter and he carried the bag of one person from our group. He also volunteered to carry my lunch. It was a fun 2.5 hour trek, complete with photo stops and food stops. We met some overnight campers from the military and they gamely posed for pictures with us! We were so excited and were not daunted by the long walk. We were in such high spirits! We passed by streams and rocks and sands and we were awed by the beauty of the place. 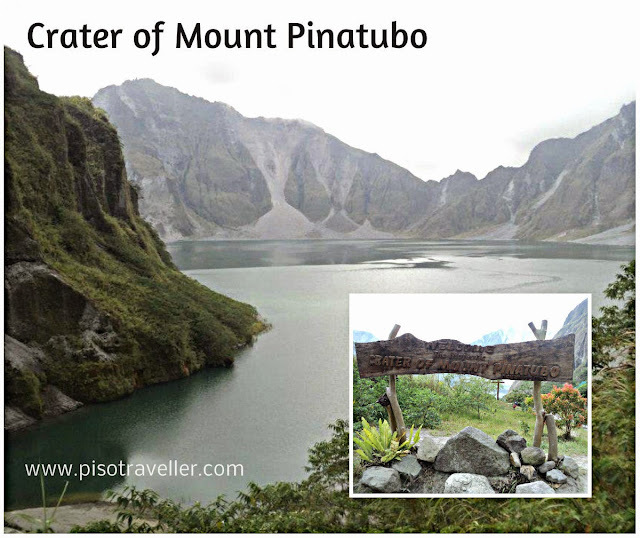 But we still cant imagine the devastation that the Mt Pinatubo eruption must have caused. After a while, the scenery turned into lush greenery! And we know we were near the summit! And of course, there were more stops along the way for photo ops! After reaching the Mt. 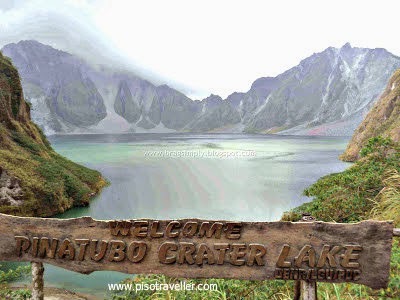 Pinatubo crater lake, we couldn't help but exclaim at its beauty! What a wonderful sight to behold after that long journey. We were awed at the magnificence of its beauty. 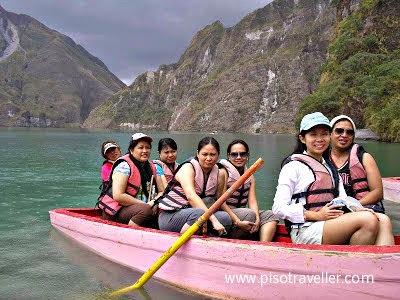 And we had to check out the other side of the lake so we rented a boat at P350 per person. And it was a beautiful as we imagined! There were pockets of boiling water in the sand. We wished we brought some eggs with us! But while the weather was perfect on our way to the crater, it was a different story altogether on the way back. 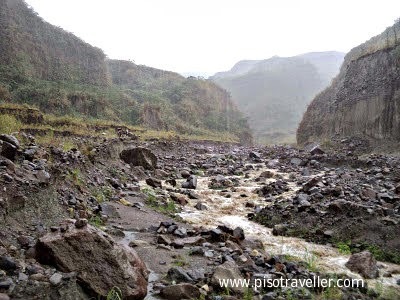 It rained very hard and we had no choice but to heed our tour guides warning to stop frequently as they take stock of the situation. After much difficulty in crossing some streams which are now rising into raging waters, they made the choice for us to climb the mountain and use the ''sky way.'' At this point, I have to commend everybody from the Sta. Juliana Tour Guide and Porters, especially our own guide Mark, because they all did a great job. They were with us every step of the way and some even carrying heavy bags while showing us the safest way to go. 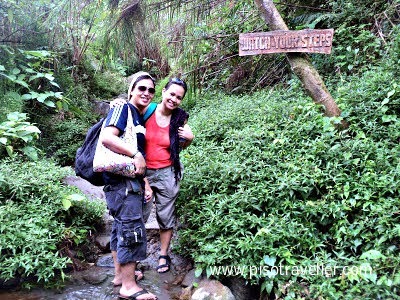 So what was earlier a 2.5 hour trek turned into a 4-hour mountaineering adventure! We trekked up a mountain of rocks and sand and walked endlessly amidst tall grass, oblivious to our wet and sad state. We were dead tired by this time and only the promise that the base camp is near, and rest is near, fueled our feet. I had to pull out my camera from my wet bag, inside a zip lock to take a photo from where we were. I didn't know then that this is exactly where we had to go down. Yes, we climbed down from this side of the mountain! It was a steep mountain and we had to step on rocks and slide down on the sand and hold on to grass to keep from falling. I don't know how we did it, or maybe we were not thinking clearly anymore because we were dead tired from 4 hours of walking, but we managed to climb safely down that mountain. So I conquered Mt. 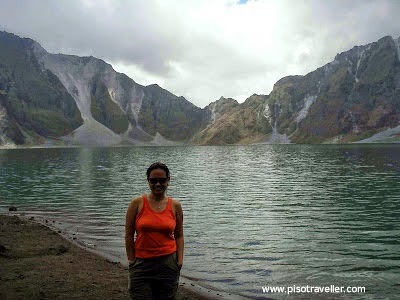 Pinatubo and more! 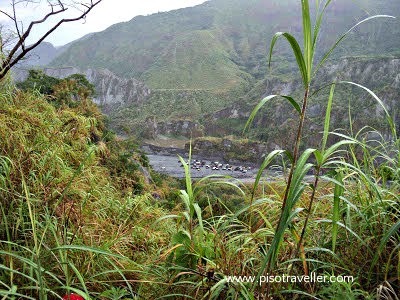 I witness the beauty of the volcano crater and survived the return trek too! I didn't know that I had it in me to still find humor in our dangerous situation but because I was with my husband and friends whom I would trust my life with me, I knew that we would make it! But after this, I wouldn't go to Mt. Pinatubo even if you pay me! And I warned my younger sister and kids to never try this! Maybe if the weather was better and we did not experience such danger, then I would recommend it to other people. But after that, I would say : TRY IT AT YOUR OWN RISK! 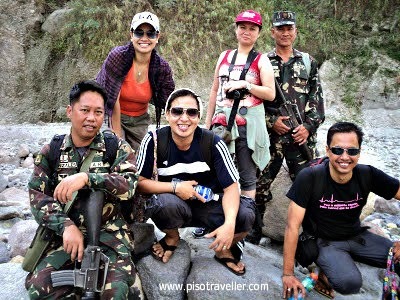 Our day tour was arranged by Trip Pinas and despite the difficulty that we had, we felt that they did a great job. 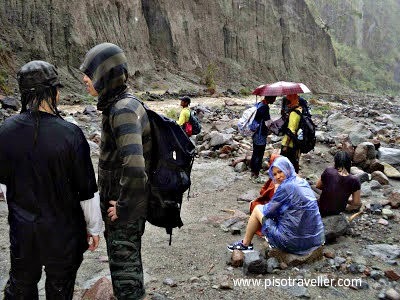 The weather is really something that nobody can control and had we not encountered the heavy rains, out trip would have been perfect. So if you still want to try this out after reading my personal experience, you may get in touch with Trip Pinas.